This section is about my experience upgrading RDF UI to the latest Drupal 8. This module was created over the summer, when GSoC takes place. As a result, it wasn’t compatible with the latest Drupal 8 development release, Beta 4. I started upgrading from the stable version, and by the time I realized there was a development version, I had already done much of the upgrading, so I integrated the changes from that branch into my upgrade while still keeping most of mine similar to how it was before. Some of the things I had to upgrade were: moving the attached CSS to a library, re-factoring the Form State from an array to an object, and accounting for the fact that Drupal\views_ui\OverviewBase was merged into Drupal\views_ui\DisplayOverviewBase. I also have included minor improvements here and there in the code. The full upgrade patch can be viewed at this Issue on RDF UI. RDF UI also comes with a very helpful sub module named: RDF UI Builder. 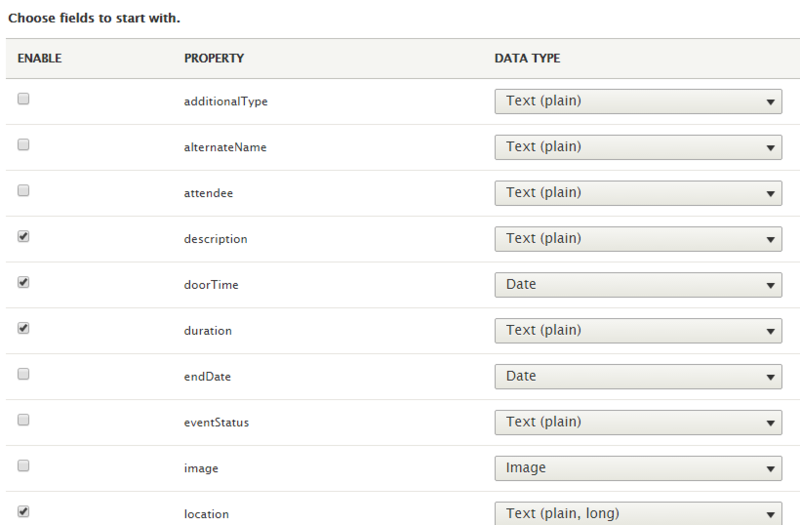 Want to shorten up all the steps above in creating Schema.org mapped Content Types? This sub module comes in handy for that very purpose. After selecting which Schema.org Type you want to use, you are redirected to the next page where the only thing you need to do is select which fields you want, and they will automatically be created and mapped for you! That’s it, now you can go off and create content for that type. Sachini Aparna Herath, with the help of her mentors Stéphane Corlosquet and Kevin Oleary, has created a great module for Drupal 8. 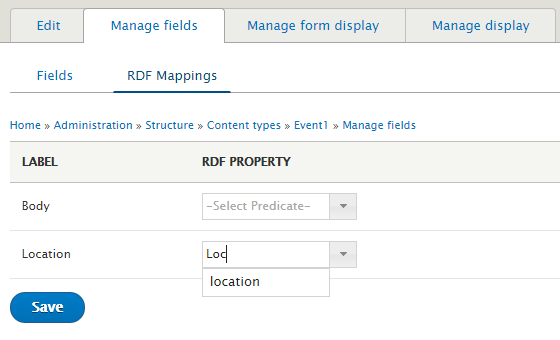 RDF UI fits in with the rest of Drupal, and can be used to quickly create content types or fields and assign them Schema.org Types and Properties. This can help any site owner to provide “semantic rich data” on their web pages. 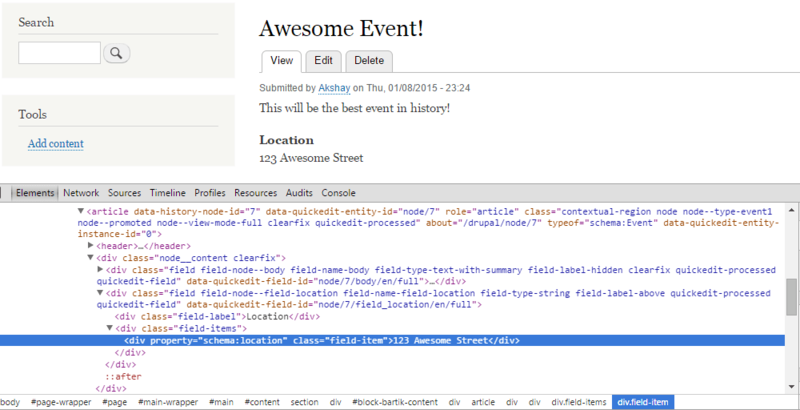 One improvement I can suggest is that the http://schema.org/Date Type should default as date only in Drupal. As of right now both http://schema.org/DateTime and http://schema.org/Date convert into Drupal datetime. This may be because Drupal does not have Date and DateTime options in the drop down. If this is the case, this improvement would be for Drupal Core to move selecting DateTime or only Date to the main select menu before selecting Date and then choosing for a new field. From a Google Code-In perspective, this task had many obstacles which I had to go through to upgrade the module to be working with the latest Drupal 8 version, Beta 4, and I am glad as I keep learning more with the more problems I face. It is also the first time I have created a change record, because one of the errors received had not been included in the list of changes. Good describtion of the module. After installation, I have a issue with it because he can’t list shema.org type. I always have item not find on schema.org even when i try simple type like Article. Do you have any workaround for this issue ? Really nice write up, thanks.